Reggie shuts down for the Winter while MA's finest conclude their season this weekend at the New Balance National Indoor Championships at The Armory in New York City. All week, we will provide a thorough preview of the Massachusetts individuals/teams heading to New York to compete for All-American status and backpack-worthy performances to wrap up the indoor track season. The lone high jumper in the championship division, North Attleborough's Owen Nassaney has been hitting his stride as of late. A massive personal best (6'-10") to win the MIAA All-State Meet helped him claim the state's highest jump this winter while putting him in a seven-way tie for US#3. A stumble at New Englands (6'-5") earned him only a bronze medal as he hopes to return to his peak to attempt to claim his first National Championship. Anna Jordahl-Henry of Wellesley (5'-8"; MA#1, US#14) leads the MA field heading into New York. The All-State champion opted to forgo New Englands to rest and peak a week later at The Armory. While other athletes narrowed the gap at the regional championships, only Sarah Lavery of North Andover (5'-6.5"; MA#4) and Aislinn Cannistraro of Somerville (5'-6.5"; MA#4) are still entered in the championship division. The Bromfield School's Samantha Schoenberg (5'-7"; MA#2) grabbed a runner-up finish at New Englands to crack the championship standard but she is still in the emerging elite division (as of this posting). In what will be a busy weekend for the recently-crowned New England hurdle champion, Acton-Boxborough's Adam Yang (24'-2"; MA#1, US#5) will be bringing in MA long jump title to defend in pursuit of All-American status. As his current US ranking sits, a replication of his Division 1 Championship performance should be enough to bring home additional honors to the senior, who is no stranger to the New Balance National Championships, having competed in the indoor/outdoor championships last year. Despite the MIAA and MSTCA not contesting the triple jump indoors, Cambridge Rindge's Sophie Wright (36'-1"; MA#3) will be bringing her three-jump title from the URI HS Classic against the rest of the country. Wright holds a 37'-8.5"personal best from outdoor competition. 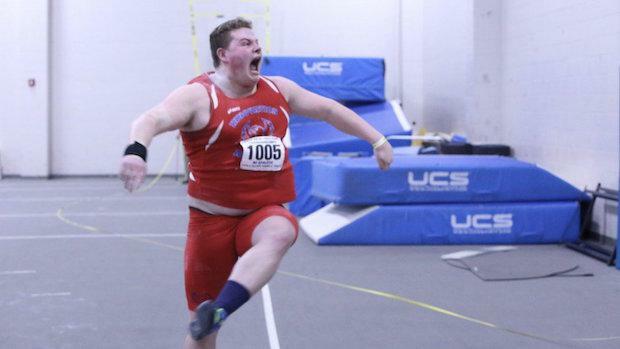 Name an invitational he competed in this year and Innovation Academy's Aiden Felty (67'-0"; MA#1, US#1) won it and broke the previous meet record in the shot put throw. He faced his strongest competition last week against US#3 Jason Montano of Thornton Academy (ME) at the New England Indoor Championships but still bested Montano's 63'-2.5" by close to four feet (66'-10.25"), his second furthest throw of the season. Barring illness or injury, Felty's two-feet lead of US#2's Patrick Piperi of The Woodlands (TX) should hold up for the Duke signee's first national title. Though not as big a favorite as Felty, Seekonk's Cameron Garabian (48'-2"; MA#1, US#2) is in a comfortable position to put the Bay State on the map for the indoor throws. The All-State and New England Champion has had an equally phenomenal year, having improved by five feet since last year. She sits only five and a half inches behind US#1 Morgan Johnson of Velocity Track (GA) (48'-7.5"), and since Garabian broke 48 feet at All-States, she is primed to peak at just the right time to compete to be the best in the country. The MA#1 weight thrower, Michael Gupta of Lexington (63'-4"), will be competing for the championship title in the rarely-contested weight throw. Though neighboring Rhode Island offers the weight throw at the state level, Gupta focused on the event this season by travelling to out-of-state competition. And it shows: he improved by eight feet from the beginning of the year to qualify. The field will be stacked but Gupta will do is best to crack into the upper echelon. The Boston Holiday Challenge Pentathlon Champion Jada Johnson of Sharon (3,288 points; MA#1, US#5) comes into the competition having forgone the MSTCA Pentathlon the week prior. Understandably, the fatigue in five events in one day should not be stretched. And Johnson earned her ticket early on in the season so she was able to perfect all the events as the winter moved on. Therefore, last year's outdoor All-State Pentathlon Champion has still kept herself busy; she won the All-State long jump (18'-6.75"), placed runner-up in the high jump (5'-6"), and then placed fourth (18'-4") and eighth (5'-3") at the New England Championships, respectively. A 30'-9.25" shot put, 8.38 hurdles and 2:39.93 800 meter run makes her an All-American threat this weekend. Four Bay Staters lead the charge in the boys emerging elite high jump, with Newton South's Danny Collins (6'-6"; MA#5) leading the way. The junior repeated his bronze medal honors from All-States (6'-4") at the New England Championships (6'-5") this past weekend. Giving him chase though, from the Massachusetts side, will be Longmeadow's Chris Johns (6'-5"; MA#7), Worcester Tech's Emanuele Dokyi (6'-4.5"; MA#10) and North Andover's Andy Robie (6'-4"; MA#11). The MA contingency will be led by The Bromfield School's Samantha Schoenberg; however, her 5'-7" runner-up jump from New Englands may move her up to the championship division, as it broke the 5'-6.5" standard. If she bumps up, there'd be a four-way battle, led by South Hadley's Lindsay Marjanski (5'-6"; MA#6) and Jordahl-Henry's sister, Julia, of Wellesley (5'-6"; MA#6). Nearly the entire MA Top 10 will be making the trip to The Armory as Wakefield's Olivia Fetherston (5'-5"; MA#9) and Watertown's Abigael Peterson (5'-5"; MA#9) round out the MA field competing on Friday. Emily Hickey of Austin Prep (11'-0"; MA#1) achieved the emerging elite pole vault standard by winning the URI Classic. She achieved the standard despite Massachusetts not offering the pole vault in competition. The junior also has a matching 11'-0" outdoor PR. A star-studded field will be toeing the jump board on Friday in the boys emerging elite long jump. Derek Chalmers of Wellesley (22'-8.5"; MA#3) capped his New Englands Championship by qualifying for NBNI, thanks to his foot and a quarter personal best. Division 3 Champion Omar Jasseh of North Attleboro (22'-5.25"; MA#6) and All-States fifth place finisher Carter Rosewell of Longmeadow (22'-2.25"; MA#7) will be looking to conclude their seasons with one final personal best. Weston's Bharathi Subbiah (18'-5"; MA#2) takes her Division 4 Championship crown to NYC on Friday. She followed her championship up with a third place All-States finish where she was bested by Chelsea's Stephanie Simon (18'-4.5"; MA#3). Simon will be joining Subbiah, bringing along championship experience following a bronze medal from the New England Championships on Saturday. The pair would give plenty of experience to Andover's star freshman Jodi Parrott (18'-1.5"; MA#6), who competed in the high jump, long jump and hurdles at All-States prior to placing ninth in the MSTCA Pentathlon. Worcester Tech's Eric Shimiyimana (44'-10.5"; MA#1) had to travel out of state to qualify for the boys emerging elite triple jump. With a sixth place finish at the 85th Eastern States Championship, at the very same Armory, Shimiyamana out jumped his outdoor personal best indoor by almost a full foot. Just missing the championship standard by an inch, Chelsea's Simon (38'-5"; MA#1) will be doubling up on the jumps with her mid-Friday afternoon action. She qualified following her win at the Dartmouth Relays. Making an indoor trip to nationals after competing in the same event outdoors last year is Andover's Kassie Brink (38'-5.75"). Brink punched her ticket thanks to her PR triple jump mark from last outdoors. Fifty-footer Beau Bernadeau of North Andover (50'-3"; MA#6) will be launching on Friday in the emerging elite division, coming on the heels of a four-foot improvement from this past outdoor season. The Division 3 third place finisher will be joined by Newton North's Henry Sobieszczyk (51'-7.25"; MA#5) after his 13th place finish at the New England Indoor Championships. Both athletes will be making their NBNI debuts on Friday. Last and not least, the North Attleboro's field squad will be complete with Julia Mechlinski (38'-6"; MA#11) competing on Friday. The Division 3 Champion, whom also excels in the hammer throw and discus, earned her mark by winning the Hockomock League at the beginning of February.